Arriving in Bombay, Raj (Raj Kapoor) is disappointed to find that honesty and integrity don't always lead to success. Instead, it seems the city's so-called "420s" are having an easier time climbing the social ladder, relying on their skills of deceit and exploitation. Unfortunately, when Raj meets a beautiful woman who makes a meager living as a teacher (Nargis), he's so overcome by his desire to impress her that he discards his values for love. This is superior political cinema with an Indian heart. InTheBasket program The Quote below from the Movie actually moved me to watch this Movie, thanks to the advertisements of Raj Kapoor Collection in SHEMAROO DVD s. Yeh Bambai he mere Bhai, yaha Building Cement ki aur Insano ke dil pathar ke. Yaha ek jhota pooja jata he, aur wo he PAISA! Great Classic from the Raj Kapoor Factory. It has a tiny bit of everything. It also has a great message. Raj Kapoor knew how to entertain the public and to pick topics in the Movies that anyone could easily identify themselves in the Characters. 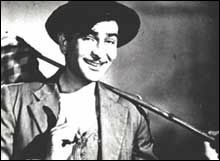 Even now. .
Raj Kapoor was "Charlie Chaplin" of Bollywood. Trivia:: The result Nargis and Raj Kapoor woking together: Dimple Kapadia:: Mother of Twinkle Khanna, Ex Wife? of Rajesh Khanna. :: :: Nargis and Bollywood mega-star Raj Kapoor formed a reel romantic couple, but it is well known that they had an off-screen romance and intimate relationship as well, but Raj, who was already married to Krishna, refused to divorce his wife. Dimple was discovered by legendary showman, Raj Kapoor, who signed her up opposite his son, Rishi, in the 1973 hit 'Bobby'. The film made Rishi and her stars overnight, at the time she was just 16 years old. hear/say Scandalous Though at that time not knowing that Dimple was his OWN Daughter. Meaning half Sister of Rishi Kapoor! Till Nargis confronted him..